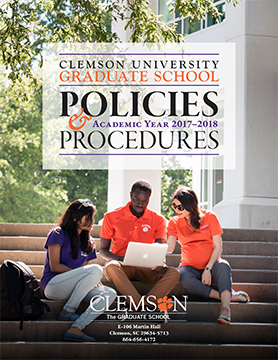 The policies and procedures of the Graduate School have been established to ensure a consistent set of standards from the admissions process all the way through to the awarding of degrees for every Graduate School program. In general, you are subject to the policies in effect when you first matriculate into your graduate program. Minor changes in policy that will not affect your progress toward a degree may be implemented immediately when that is determined to be in the best interest of students and/or the University, or if the changes are required by a legislative or regulatory body. 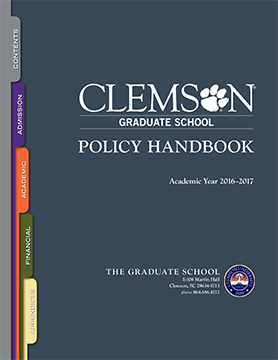 These changes, along with all other substantive changes, will be noted in the “Changes to Graduate School Policy, Annotated” page(s) of this handbook and in the table on this page. 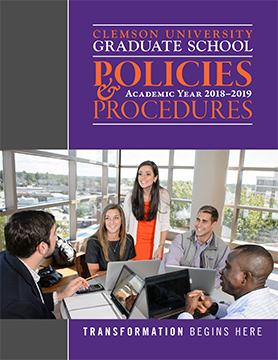 The Graduate School strongly recommends that everyone consult the most current version of the handbook each time you need a policy reference, to ensure that you are accessing the most current information. 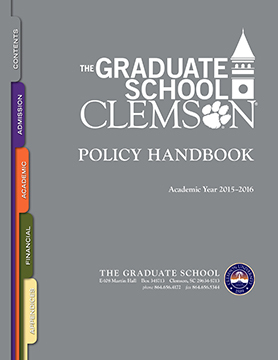 These changes begin with the 2015–2016 academic year, when the Graduate School Policy Handbook was first published as an interactive PDF document. In most cases, the Date of Change column indicates the term in which the new or updated policy first applies. Combined bachelor’s/master’s plan Fall 2015 Number of required credit hours, course level, and maximum research hours added to clarify requirements. admission appeals Fall 2016 Dismissal policy and procedure wording updated to clarify roles of program coordinator, Graduate School dean. Dismissal Appeals changed from subtopic to topic. Academic renewal Fall 2016 Updated Form GS00, Request for Academic Renewal and clarified that Graduate School approval of form indicates consideration for readmission. Readmission Fall 2016 New policy outlines conditions and procedures for readmission to the University following a dismissal as a result of an undocumented/unapproved leave of absence. Continuous enrollment Fall 2016 Updated policy. Topic updated to cross-reference new leave of absence and readmission policies. Includes section on failure to maintain continuous enrollment. Leave of absence Fall 2016 New policy outlines conditions under which a student may request a time-specific leave of absence, and procedure for doing so. Includes new form GS-LoA. Academic grievance policy Fall 2016 “Procedures for Academic Grievance Committee” updated to replace requirement for transmission of paperwork by certified mail with transmission via secure email. Academic grievance policy Spring 2017 Updated to include IGRB proceedings prior to full review by Academic Grievance Committee. Committee structure redefined to accommodate new College structure. Time limit for doctoral programs Spring 2017 Time limit for completion of all doctoral program requirements (including master’s en route to PhD plans) updated from five years to eight years. Graduate faculty status Fall 2017 New policy and guidelines added. Advisory committee Fall 2017 Committee structure and member qualifications updated. Theses and dissertations (ETD) Fall 2017 Clearer timelines for thesis and dissertations and strict adherence to deadlines approved by Academic Council for fall 2017. ETD embargo Fall 2017 Policy and procedure for thesis/dissertation embargo (delay of publication) updated. Form GS6-Bachelor-to-Graduate Fall 2017 Name of form GS6BSMS, Request for Combined Education Plan amended for clarity: plans are not limited to BS and MS programs. Withdrawing from the University Fall 2017 Official Registrar’s withdrawal form approved by Academic Council for fall 2017. Replaces online withdrawal via iROAR. Doctoral residency Fall 2018 Outlines and expands upon conditions and alternatives for doctoral candidate residency, given expansion over time of off-campus, online, and part-time doctoral study options. Dismissals Fall 2018 Determines which entities oversee dismissal; details infractions that warrant dismissal, sanctions, and criteria for student return following dismissal, where applicable. Preparing graduate teaching assistants for the classroom Fall 2018 Describes expectations of GTAs and lays out GTA training framework. assistants Fall 2018 Defines state and institutional requirements for teaching-related language proficiency for international graduate teaching assistants. Refreshments at defenses Fall 2018 Students undergoing oral examinations may not provide refreshments, gifts, or other inducements to committee members or attendees. Approval of thesis/dissertation research proposal Fall 2018 Facilitates process by which advisory committee and Graduate School approve the student research/manuscript proposal concurrent with results of oral or comprehensive exams. Procedure includes a new form, GS-ResearchApproval, Approval of Thesis/Dissertation Research Proposal. **hosted on the Registrar's website. The Registrar's cataloging system has changed since the 2016–17 academic year, so older catalogs are archived in PDF format, while new catalogs are live and HTML-based.